Looking to do historical research with the New York Times? 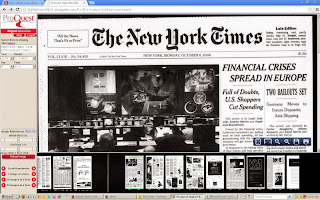 We now have access to digital microfilm through Proquest New York Times Digital Microfilm database, which provides full text/full image articles in PDF format. Using this is similar to reel microfilm, as you get to see the news stories as they were intended. Viewing the articles presented amidst the editorials, letters to the editor, obituaries, birth and marriage announcements, photos, and advertisements can sometimes lead to a greater understanding of the history in that time. This new resource to Lane Library is a great way to read the story in context to what was going on in the news that day, through the ease of your computer. You can access the NY Times Microfilm Database via the Lane Library home page, clicking on the Databases & Journals tab and using the drop-down menu. Looking for NY Times articles from 1914-present? While the ease of use in this database is great, as you can zoom, browse, print or save individual pages, the database only has access from 2008- present (about 2 months behind current date) which does limit its usability. If you are looking for anything more recent, Lane Library holds the paper format of the NY Times in the reference and periodicals area on the main floor (floor 3) for the past 2 months. If you are looking for editions older than 2008, you should look to use the microfilm. Lane Library's collection includes NY Times microfilm from 1914- present on floor 1A. To search the NY Times microfilm collection, regardless of whether you are using digital or regular microfilm, you will want to familiarize yourself with the New York Times Index in order to do a successful search. You will find the NY Times Index available next to the microfilm on floor 1A for ease of use with the microfilm collection. To add to your options, there is also access through the LexisNexis database also found on the Lane Library home page through the database tab, then using the drop-down menu. 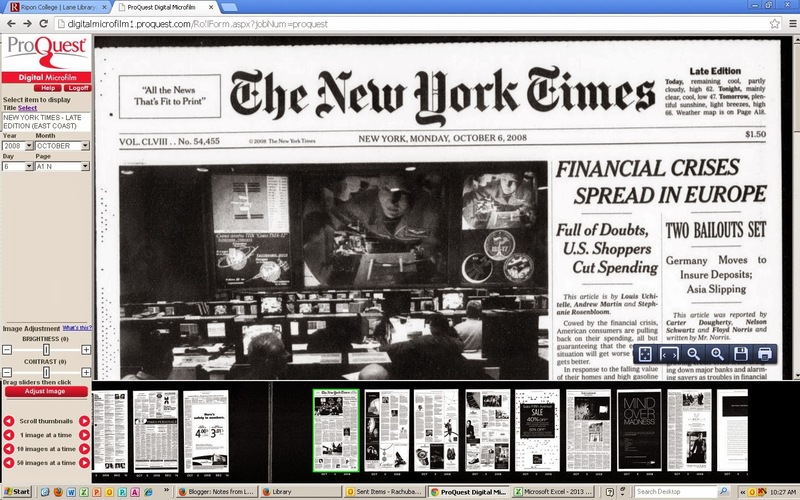 With this you can do various searches of full-text articles of the New York Times from 1980-present. This database is updated daily, providing you with immediate access to today's articles. It also searches NY Times article abstracts from 1969-1980. If any of this seems daunting, please ask a librarian for help. We are always willing to walk you through the process and have you researching like a pro in no time.